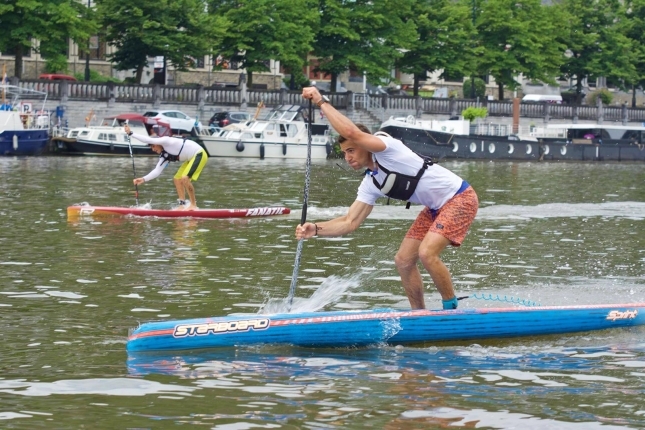 In brief: Frenchman Jeremy Teulade has claimed Week 8 of the EuroTour for Team Starboard, out-sprinting Norm Weber (Siren), Davide Ionico (Fanatic), Martin Letourneur (Hobie) team mate Boris Jinvresse, compatriot Joseph Gueguen (Nah Skwell) and home country hero Joep van Bakel (Fanatic) after almost an hour and a half of tight, flat water racing in the Belgian city of Namur to win the Happy Summer SUP Race. Dutchwoman Petronella van Malsen (Fanatic) proved too strong for rising French star Amandine Chazot (Starboard), crossing the line one minute clear in a time of 1:31:44. The marathon EuroTour continues on next week to Greece, before hitting Finland, Italy, the Azores and wrapping up at St Ives in the UK. More coverage from Namur over on the official EuroTour Facebook page. 17 Frank Gondek 1:34:24 0.55 BIC ?